The mini motor is only 39 inches high and 26 inches wide and was converted by car fanatic Perry Watkins, 47, from Wingrave, reports the Daily Telegraph. 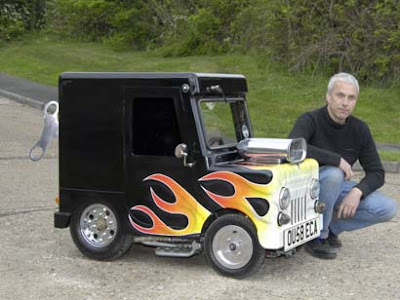 The US-based World Records Academy has confirmed that the car - which Mr Watkins has christened 'The Wind-Up' - is officially the world's smallest car. Mr Watkins, who has previously broken the record for the world's lowest car three times, found the inspiration for his latest motoring endeavour while surfing the internet. "I searched on eBay for something suitable and found a Postman Pat coin-in-the-slot children's ride from a vendor in Scotland," he said. "It was in non-operative order, but for what I had in mind this was of no consequence as I only wanted the bare fibreglass body from the ride." Over a period of seven months, Mr Watkins reinforced the fibreglass shell with a steel frame and mounted it on a mini quad bike. He added a 150cc engine, mirrors, windscreen wipers, lights, 'go faster' flames and mock racing exhaust pipes. He also had to remove Postman Pat and his black-and-white-cat Jess from the inside. The vehicle is fully legal and is taxed as a quad bike so Mr Watkins can drive it on public roads. But at 6ft tall, he might be better sticking to his company Jaguar.